Announcing the 14th edition of Agile India Conference with brand new themes and a fabulous lineup of speakers. Agile India is Asia’s Largest & Premier International conference on Leading Edge Software Development Methods. Sponsors: We thank Scrum.org, AddTeq/Atlassian, Scaled Agile, ICAgile and Scrum Alliance for sponsoring the conference. If your organization wants to support this non-profit, volunteer-run conference, please check out sponsorship options. Look forward to meeting you at the conference!! Would you like to present at Agile 2012 Conference? I am producing the Agile Development Practices Stage with my Co-producer, Chirag Doshi at the Agile India 2012 conference to be held in Bangalore. Being agile and realizing success requires being committed and applying certain set of practices continuously and sincerely. How we behave, how we communicate, the set of practices we follow all affect our results. We will focus on technical, sociological, and other practices that affect and influence the ability of individuals and of the teams to attain agility and realize success in their development activities. We will learn real tried and tested practices from practitioners who have gained hands-on experience from real life projects and have the ability, willingness, and passion to share those with us. Today almost every company is agile, but not everyone is succeeding with it. What sets the winners apart? There are some overarching principles, however, success comes from day-to-day activities, behavior of individuals and teams, how they interact, how they react, and how they foster a conducive environment for success. All the principles we can learn is of little use if we don’t practice sincerely and pragmatically to realize the results. This stage will help developers share practices from their real-life experience, things that worked for them, why, how, and to what extent they used and should be used. Would you like to share with other practitioners? To know more about submitting a proposal, please go through http://agileindia2012.agilealliance.org/for-speakers and submit your proposal using the submission system. If you have a topic that does not suit this stage, you can submit your proposal to other stages. Agile Alliance is organizing the largest Agile conference in India called Agile India 2012 — http://bit.ly/r7nfzw. The conference will be hosted in Bangalore, India around 2nd week of Feb 2012. Visit http://agile2012.in to submit your stage proposals. Please read the Stage Producer’s FAQ Sheet — http://bit.ly/penVO1 for more details about the responsibilities of a Stage producer. Hurry! The last date for submitting stage proposals is 14th Aug. Yesterday I spoke at an STTP, a Short-Term Training Program on “Integrating Security and Software Engineering” for Teachers of various engineering colleges from various cities in the state, held at D. J. Sanghvi College of Engineering. 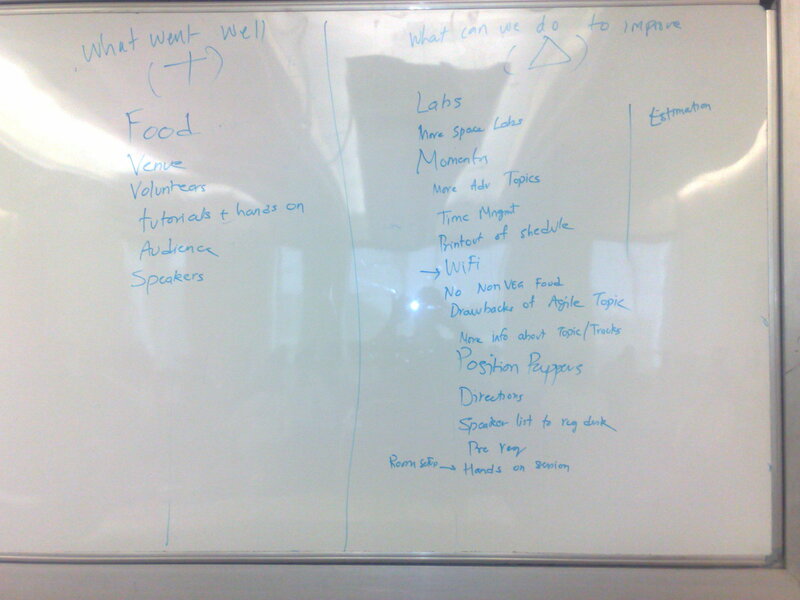 It was an introductory session on Agile Methodology and TDD. 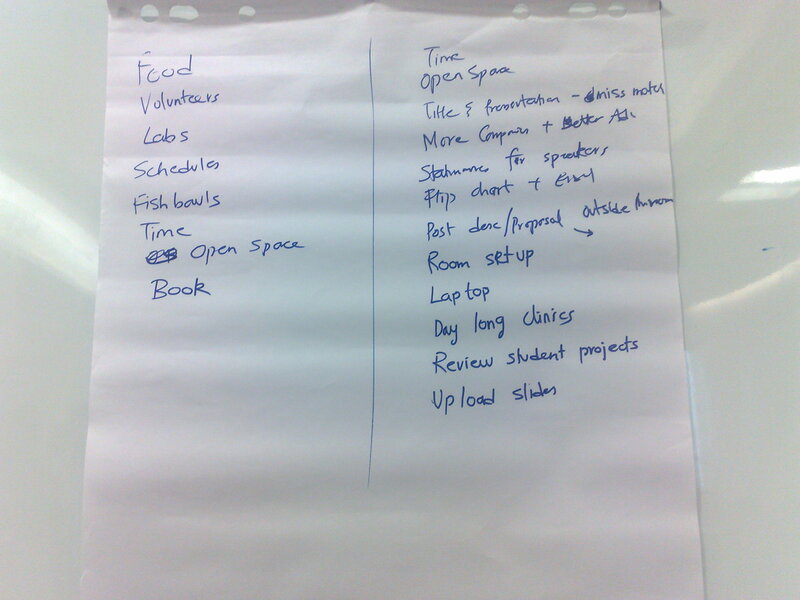 One of the things that I found was there was very little awareness of Agile Approach and TDD. It is important to note that this unawareness must be addressed to bridge the gap between Industry and Institutes. These practices are best learnt on the field; going by the book helps to understand the concepts (but in my opinion, its best to teach from experience) and application of the concepts is what drives things into head and puts things in perspective. So, unless trainers themselves do not go through the experience, how would they cure the pain that they never felt? Training the Trainers as a initial step for bringing awareness. Industry and Institutes should join hands and arrange for sabbaticals. Bodies like ASCI (http://www.agileindia.org) can help here and currently as I know of, there are efforts underway to materialize this. Mumbai Agile 2008 Conference Finishes Great! Wow…indeed for us in Mumbai, this was a 2nd great conference in Mumbai after 2005, there were around 125+ participants from various companies across the country, and not just from Mumbai and Pune. All the sessions were quite interesting and delegates have benefited from them. This is quite clear from the retrospectives that we have had and I am documenting them, so that we are reminded of things to improve upon for the next time around. Proud to announce that we’ll be having the Second Mumbai Agile Conference. We plan to keep 3 parallel tracks completely filled with hands-on tutorials. All stuff no fluff. We are inviting National and International tutorial presenters. Practitioners: who are interested in hands-on tutorials about Agile Practices. Venue: Mukesh Patel School of Technology Management & Engineering (http://www.mpstme-nmims.org), Vile Parle (West), will be hosting the conference. The evening of 7th January, 2006 indeed was a memorable one, with the Agile Users Group Mumbai’s (soon to be renamed as ASCI Mumbai User Group) first meeting kicked-off by James Shore. I was mulling over starting a mumbai based user group for like minded people to come together ever since the ASCI mumbai conference. What could have been a better opportunity than this, where we have James Shore visiting Mumbai? Everything for the meeting fell in place very quickly with conference room booked just a day ahead. Thanks to Bhavin for sponsoring the Conference room. In all we were 5 participants and topic of the discussion was “Overcoming obstacles in implementing Agile”. Today, XP and SCRUM are couple of widely adopted Agile Methodologies, the latter being a management approach whereas the former being an Engineering approach. We wrapped up the discussion by talking about estimating as to where do they come from (past experiences etc…) and how do they change especially in the context of Fixed bid projects. A lot of our discussion also spilled over the dinner too! I must say it was unstoppable, however we had to respect the time and the fact that James was jet lagged. Indeed all these interactions are memorable. Thanks to Neeru Shore for taking the pictures all through the discussions. It is decided that the user group will meet once a month and the next meeting will be announced shortly.